Author: Harvey, Miles Set In . . .
"Every once in a blue moon you read a book that leaves you absolutely breathless, reminding you of the bright, hidden worlds within our world. This is that book, a glimmering, supersonic journey into terra incognita, where Miles Harvey, acting as writer and sleuth, pursues America's greatest map thief. This is a riveting, hilarious book of twists and turns, unexpected confessions and deep human truths. You will not rest until the last page." The Island of Lost Maps is the story of a curious crime spree: the theft of scores of valuable centuries-old maps from some of the most prominent research libraries in the United States and Canada. The perpetrator was the Al Capone of cartography, a man with the unlikely name of Gilbert Bland, Jr., an enigmatic antiques dealer from south Florida whose cross-country slash-and-dash operation went virtually undetected until he was caught in December 1995. 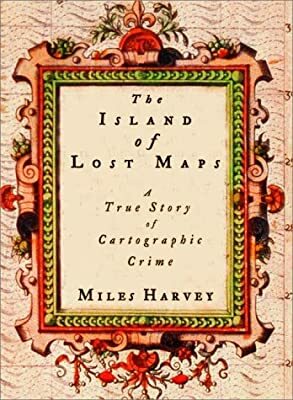 This is also the spellbinding story of author Miles Harvey's quest to understand America's greatest map thief, a chameleon who changed careers and families without ever looking back. Gilbert Bland was a cipher, a blank slate--for Harvey, journalistic terra incognita. Filling in Bland's life was like filling in a map, and grew from an investigation into an intellectual adventure. Harvey listens to the fury of the librarians from whom Bland stole. He introduces us to America's foremost map mogul, a millionaire maverick who predicted the boom in map collecting. He retraces Bland's life, from his run-ins with the law to his troubled service in Vietnam. And finally, with the aid of an FBI agent, Harvey discovers the Island of Lost Maps. The deeper Miles Harvey investigates, the more we are drawn into this fascinating subculture of collectors, experts, and enthusiasts, all of them gripped by an obsession both surreal and sublime. Capturing that passion in perfect pitch, The Island of Lost Maps is an intriguing story of exploration, craftsmanship, villainy, and the lure of the unknown.